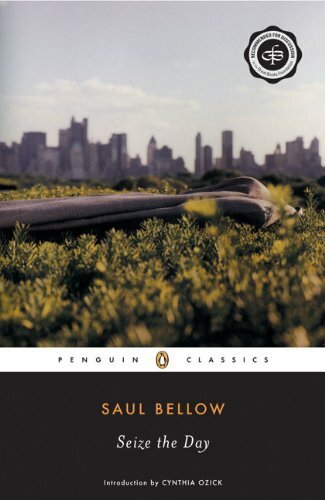 Seize the Day by Saul Bellow is one of the worst books I have read to completion, so the essay that follows should not be taken as a recommendation so much as a deconstructive cheat sheet for anyone who is considering or being coerced to read it. With any luck, this will be the last so-called close-reading I have to do in, like, ever. The protagonist of Seize the Day by Saul Bellow is 44 years old, married, and a father, but continuously exhibits tendencies that suggest he’s trapped in some kind of arrested development. Themes of adolescence, adulthood, and masculinity to a lesser extent all pervade Seize the Day, and Bellow traces most of Wilhelm’s psychological malaise back to a lack of sympathy from his father, Dr. Adler. Instead of giving in to pity, Adler’s apathetic attitude towards his beleaguered son compounds with Wilhelm’s problems, engendering a cycle of passive behavior and unfulfilled dependency on paternal affirmation. The further Wilhelm drifts from his father and his father’s approval, the harder he finds it to attain fulfillment as a grown man, and the more entrenched he gets in a prodigal son inertia of his own making. The final scene depicts the culmination of all Wilhelm’s varied reversions to childhood, rendering Seize the Day an essentially deterministic novel. Although Wilhelm thinks, “Dad never was a pal to my when I was young,” the son’s first major act of straying from his detached father is abandoning his education to chase after a highly dubious career in acting. Wilhelm bears disdain towards academic pursuits, personified by his cousin Artie, an intelligent professor whom his mother casually brings up to avail him against leaving for Los Angeles. Artie is competent in multiple languages, and Wilhelm dislikes him for that very fact, thinking him “boring” or, worse, cynical. How could anyone bear to know so many languages… Did Artie love his languages, and live for them, or was he also, in his heart, cynical? So many people nowadays were. No one seemed satisfied, and Wilhelm was especially horrified by the cynicism of successful people. As a child might, Wilhelm strains to see the value of learning in and of itself, and looks down on the elitism he observes in people like Artie or Adler, whom he deems a “vain man”, albeit a respected and medically knowledgeable one. Moreover, he condenses the nearly two years of college he did experience into a set of memories with no educational aspect, and prides himself on eventually taking a different course. Sometimes he told people, “I was too mature for college. I was a big boy, you see. Well, I thought, when do you start to become a man?” After he had driven a painted flivver and had worn a yellow slicker with slogans on it, and played illegal poker, and gone out on Coke dates, he had had college. Nonetheless, for one reason or another, Wilhelm chooses to lie about his educational history, perhaps for fear of being rebuked, perhaps because he knows subconsciously he was wrong and doesn’t want to admit it. “Wilhelm respected the truth, but he could lie and one of the things he lied often about was his education, [saying] he was an alumnus of Penn State.” In fact, the son lies constantly, even to himself sometimes, and when he isn’t lying, he happens to be drawn to habitual liars, viz. Tamkin and Venice. First he lies about his prospects of actually making it in Hollywood, massively inflating the credibility of Venice’s offer when “the scout had never made him a definite offer of a studio connection”. Once his trust in Venice starts to disintegrate, he lies to his parents yet again, saying the scout fully believes in his acting talents. Then he lies to his father about the pills he’s taking and the woman he has been seeing in Roxbury. In puerile fashion, he refuses to take responsibility whenever he is in the wrong, up until the very end, when he tells his pale father, “I should have listened to you,” but not before checking to see if the masseur is paying attention to them. Even after this humble admission, though, he backpedals and hides behind “bad luck”, the perennial cause of his woes. Just so, he reels at the thought of groveling before his former employees and begging them to take him back. “I can’t get on my knees to them,” he exclaims. “Rojax take me back? I’d have to crawl back.” His character is completely passive and determined by his social climate, borne along by forces he dares not oppose. This fact elucidates the meaning of one of the final scenes, in which he walks along Broadway with a great crowd, “in every face the refinement of one particular motive or essence – I labor, I spend, I strive…” (111) In such a crowd, the motiveless Wilhelm must stand out. The protagonist also balks at opportunities to promote himself, letting his father do that work for him. Multiple times Adler is described as a salesman, boasting of his son and daughter to business associates, but Wilhelm considers this inappropriate. “Now God alone can tell me why I have to lay my whole life bare to this blasted herring here. I’m sure nobody else does it.” Repelled by the success of his father, he generally shies from asserting himself in any threatening capacity or even from contradicting other people. Like a typical millennial critic who’s afraid of drawing harsh words from others, he peppers his speech with weasel phrases that downplay his own observations as subjective and undermine the purpose of argument altogether. Bellow writes, “When he was forced to differ he would declare, ‘Well, I’m not sure. I don’t really see it that way. I’m of two minds about it.’ He would never willingly hurt any man’s feelings.” He won’t venture even to criticize his sister Catherine’s art, waving away any misgivings he has with it as a matter of personal taste. Driving home his pessimistic determinism, Wilhelm also has a habit of hugely overstating and dramatizing the plights in which he finds himself, bringing everything back to his literal suffocation and murder. “It would kill me to go back to school now,” he tells Venice at one point. Later in the book, he actually starts choking himself in front of his father to demonstrate his wife’s animosity towards him, and on the phone with her he yet again brings up the topic of her choking him. “You must realize you’re killing me,” he says. “You can’t be as blind as all that. Thou shalt not kill! Don’t you remember that?” When Tamkin elaborately compares money-making to the art of killing, Wilhelm listens, ill at ease, possibly because he connects it to his own life. All these references to or mock enactments of violence serve two purposes: first to emphasize the childish mentality of Wilhelm, second to show how powerless he feels to change his fortunes. Bellow insinuates the son’s immaturity, and the immaturity of modern society broadly, in many other ways both subtle and patently obvious. As an example of the former, there is Wilhelm’s heavy reliance on Coca Cola, which Mr. Perls disapprovingly notices him drinking for breakfast. As for the latter, the point that Wilhelm’s job at Rojax Manufacturing involved selling “kiddie’s furniture” can hardly be dismissed as mere coincidence. Extended adolescence applies to women too in the world of Seize the Day: inside the cafeteria, Wilhelm observes a crowd of elderly ladies who are heavily made-up and acting in a manner he thinks unbecoming of their age. “Were there no longer any respectable old ladies who knitted and cooked and looked after their grandchildren?” At the same time, the sight of the ostentatious women stirs in him a memory of how his grandmother treated him as a small child, implying that he is still mired to some extent in the stage of youth. In his argument with Margaret on the phone, the wife expresses dedication to her traditional role as mother, saying, “Growing boys need parental authority and a home,” but even this exchange harkens back to the theme of Wilhelm’s arrested development. Margaret says she has cannot afford to get a job if it means having a couple kids running loose, to which Wilhelm replies, “They’re not babies. Tommy is fourteen. Pauline is going to be ten.” In this aspect, Seize the Day has become even more pertinent with age. 50 years ago, a man might have been shamed and frowned upon for suckling off his parents after college, or even after high school; now, under Obamacare, young Americans can continue to reap some of childhood’s perks until they turn 26. Wilhelm’s objection to Margaret’s babying of his kids reflects his ongoing struggle to reconcile his true age with his emotional need for validation from his father. At least twice in the book he crosses himself for acting like a little kid with respect to Adler, and characters often reinforce that impression in his mind, Adler scolding him for speaking “nonsense and kid’s talk” and Tamkin arguing with him “dryly, as though he were dealing with a child”. Bellow seems to make the case that Wilhelm’s firmest claim upon adulthood is his ability to regulate his emotional vulnerability in public, viz. by suppressing the urge to cry. In his protracted conversation with Wilhelm, he feels tears welling up at one point but does not let them out. Later, in the brokerage office, he fights the temptation even harder. His need to cry, like someone in a crowd, pushed and jostled and abused him from behind, and Wilhelm did not dare turn. He said to himself, I will not cry in front of these people. I’ll be damned if I’ll break down in front of them like a kid, even though I never expect to see them again. No! No! And yet his unshed tears rose and rose and he looked like a man about to drown. By the protagonist’s correlation of crying with his own latent childishness, the last scene of Seize of the Day signifies more than just the “consummation of his heart’s ultimate need”. 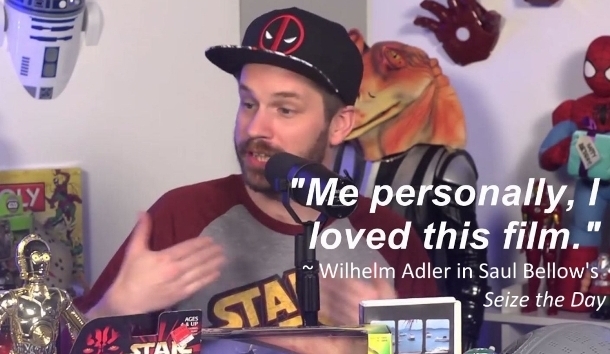 It also shows that Wilhelm has given up on attaining the one thing, his father’s approval, that would make him feel like a mature man, implying also that he’s given up trying to determine his own fate.